LÀO CAI – The development of the family doctor model will go together with the health system at the grassroots level. This is one of the targets of the family doctor model expansion plan in Việt Nam in the 2016-20 period, which was launched at a conference held by the health ministry (MoH) yesterday in the northern mountainous Lào Cai Province. During the conference, health experts shared experiences and thoughts about the development of the family doctor model with the aim of improving the health system at the grassroots level. 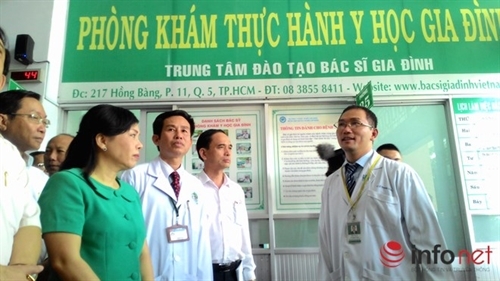 Trần Giáng Hương, director of the International Co-operation Department under the MoH, said the family doctor model was run in pilot programmes in eight provinces and cities. The programmes made several achievements, but still met some difficulties in operating the model, and in incorporating it with the local health system effectively. The country now has 1,200 doctors specialising as family doctors. Several participants at the conference said the number was few compared to the real demand, and so the health sector should consider assigning more doctors to work as family doctors, and prepare plans to train family doctors. Trần Quý Tường, deputy director of the MoH’s Medical Services Administration, said effective expansion and implementation of the family doctor model was expected to reduce hospital overcrowding and improving the workforce for local medical stations.